The normal tracking areas include waiting areas, exam rooms, infusions, treatments and induction/recovery. This information is visualized by means of the RFID whiteboards. RFID brings the radiation clinic’s efficiency and experience to unprecedented levels. 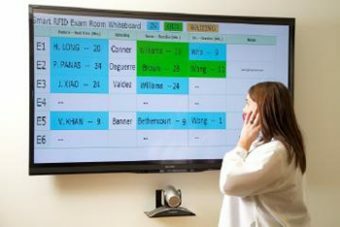 In the smart RFID clinic, patient location and wait times are automatically recorded once the patient enters a specified area of the clinic. The normal tracking areas include waiting areas, exam rooms, infusions, treatments and induction/recovery. This information is visualized by means of the RFID whiteboards. These web-based tracking whiteboards can be accessed by staff from their desktops or handhelds. The clinic can operate more efficiently and patient wait times can be significantly reduced resulting in much improved patient satisfaction.